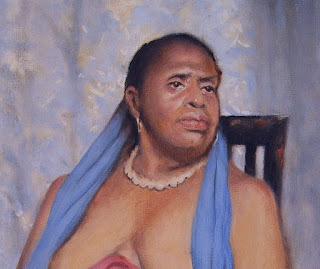 Here is a snippet from a recent portrait, done at the League. This piece is not quite complete. I had misgivings about some design and composition choices outside of my control. I do feel that the head is strong enough that it should be saved, so the final picture will likely be cropped along the lines of this image. 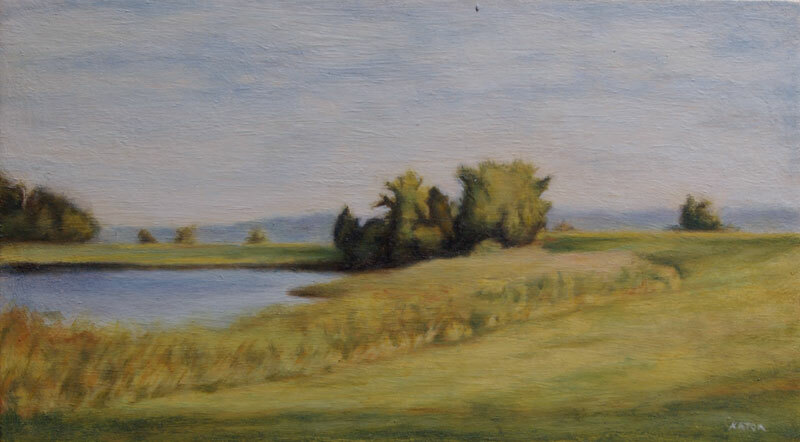 This small painting was recently done while I was at the Art Students League. Time and space were tight, so I chose to do a small figure painting, rather than a portrait. It is interesting to revisit the figure, from the vantage point of everything I have learned and experienced over the years. The classical atelier studio imparts a certain feel and character to my work. Earlier this month, I needed to have a picture ready for a show, on short notice. The tight time frame mean that I could not order a frame and have it ready by the deadline. I chose to build the frame on my own, for the first time. The next step was to cut all four pieces to size, and miter the corners so that the frame could fit together. Getting good miters is a tricky operation. All four corners need to be exactly 45 degrees, and all equal sides must be the same length. Any errors multiply on all four sides. I did the miter cuts on a table saw, using a miter gauge. The angles were set accurately, using a drafting triangle. Each side of all four pieces were cut in sequential order. To ensure that each side was the same length, I clamped a stop block to the miter gauge. Each piece was held against the block so that they were run through the saw at a fixed distance from the blade. 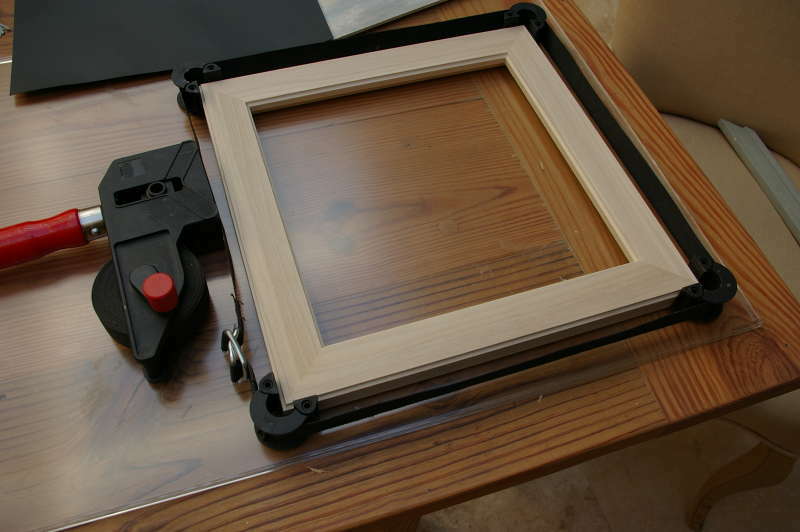 The finished pieces were carefully glued together using my framing clamp. The frame was left to cure overnight. I picked out a wood stain that I thought was complementary to the picture. 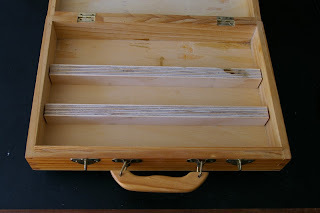 The stain I chose was semi-transparent, so that some of the wood texture and color would show through. I applied several coats and wiped it smooth. Overall I'm pleased with the results, and I consider making more frames in the future. 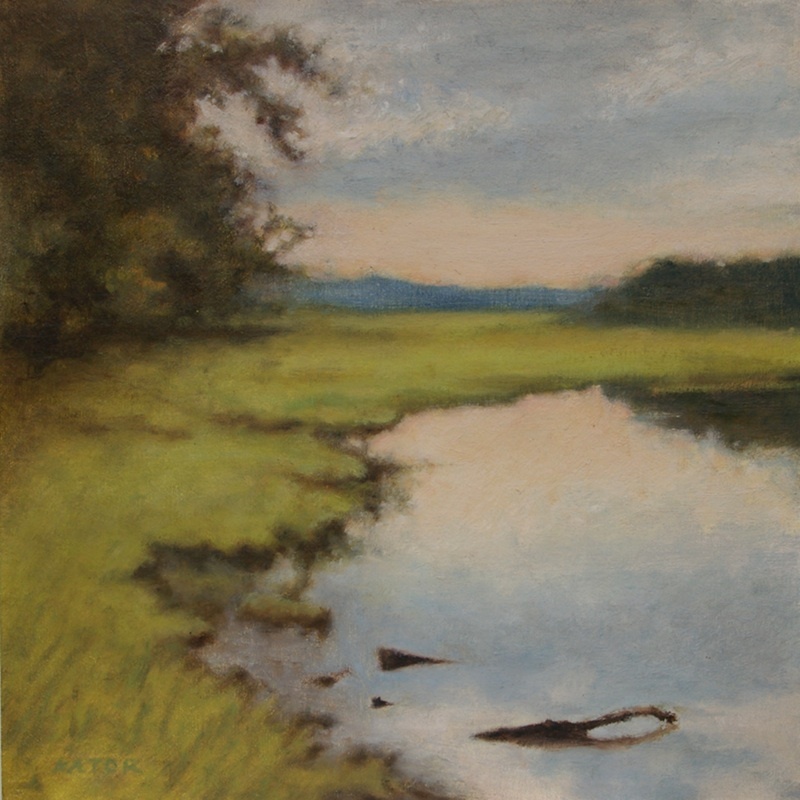 Oil on Panel 10" x 10"
Pochade refers to a French word meaning pocket, and what artists called small paintings that could be carried in one's pocket. 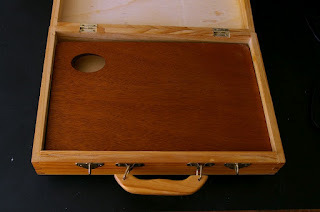 A Pochade Box is a very small portable easel. Most painting locations I work with are easy to access by car or a short walk. 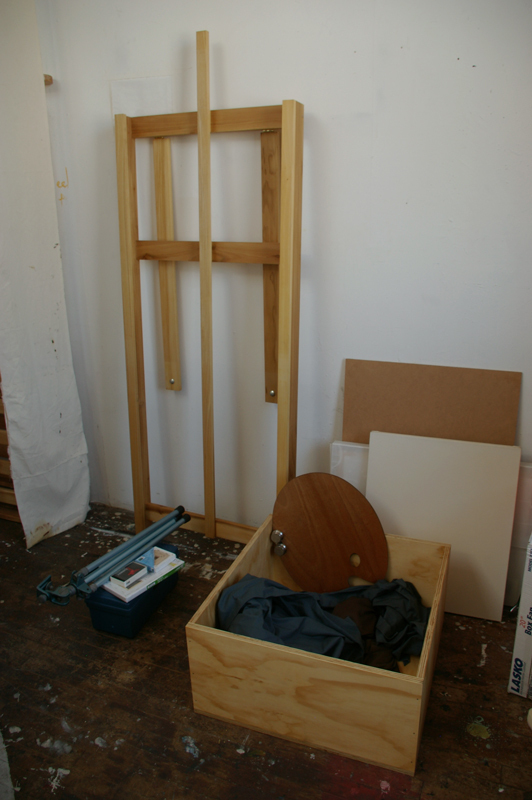 Longer distances with the easel, palette, and brushes are unwieldy. I decided that one of these boxes might come in handy in these situations. I looked into purchasing a pochade box, but found the basic models too expensive for what they offered. I decided to make my own. I didn't have a lot of time on my hands, so I forgoed building one from scratch. 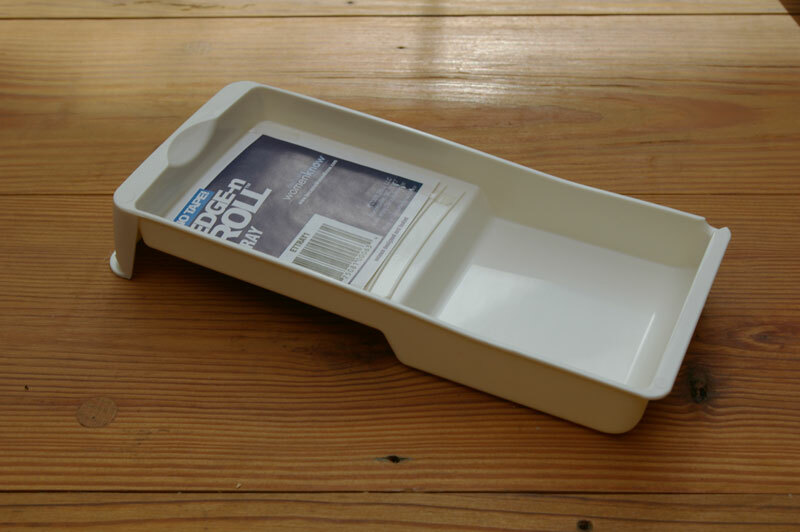 Instead, I went looking for a ready made box that could be adapted easily to the task. I found this child's tool box at a local second-hand store. With some modifications, it would do a nice job. 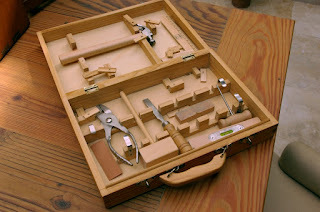 The box was stripped of all of its parts and two slots were glued inside. I cut a small cheap palette to fit inside the box. 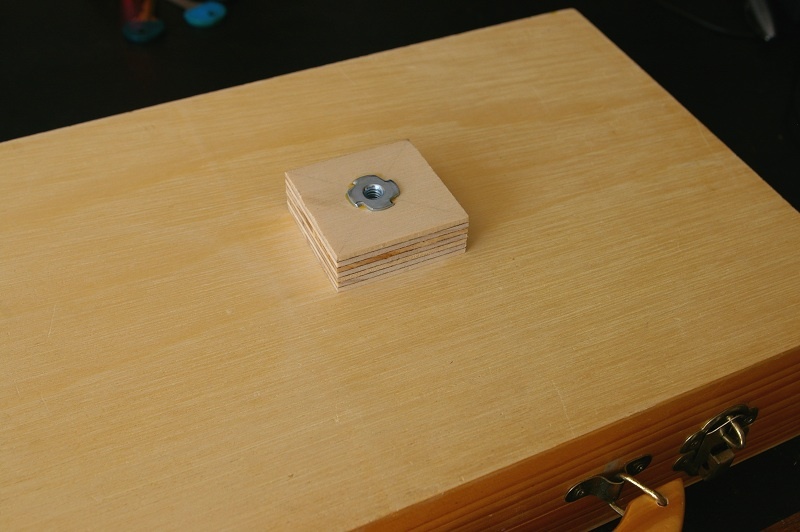 A piece of plywood was glued onto the underside containing a threaded fitting. The threads will mate with a tripod mount, so that the box can be set up on location. There are a couple additional parts to add to my box. For one, the top half should have some kind of locking hinge, so that it can be held open at a desired angle. Adding clamps to hold the artwork in place, would be useful as well. This box can accommodate small pictures under ten inches. Overall, I'm pleased with the results, and the final product was not expensive. This portrait was a quick oil-sketch, done at the Art Students League of New York. The ASL hosts an open painting session on Saturdays throughout the day. It is relatively cheap, has good natural light, and the models are usually excellent. This model had an interesting intense look, supplemented by a strong build. Getting good light out of any new studio can be difficult. Good light in this case refers to the quality, not quantity of light in an art studio. The ideal setup for natural light would be a high-facing north window. This provides the simplest, most stable light source throughout the day, avoiding direct sunlight. Having reliable, stable light and shadow patterns is incredibly important when it comes to figurative work. My studio was not the ideal. On one wall there was a large window facing the southwest. On the roof, several large skylights flooded the studio with light. Direct sunlight flooded the room at various times of day. The challenge was to figure out if I could work around the studio's limitations. Long term, I could consider finding a better workspace. 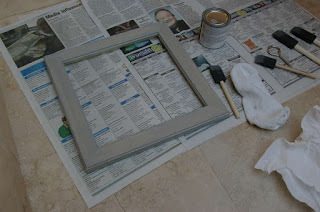 To deal with the window, I built a small wooden frame to inside. The frame was covered top to bottom with tracing paper, blocking direct sunlight helping to disperse the light. There was nothing I could do about the skylight. 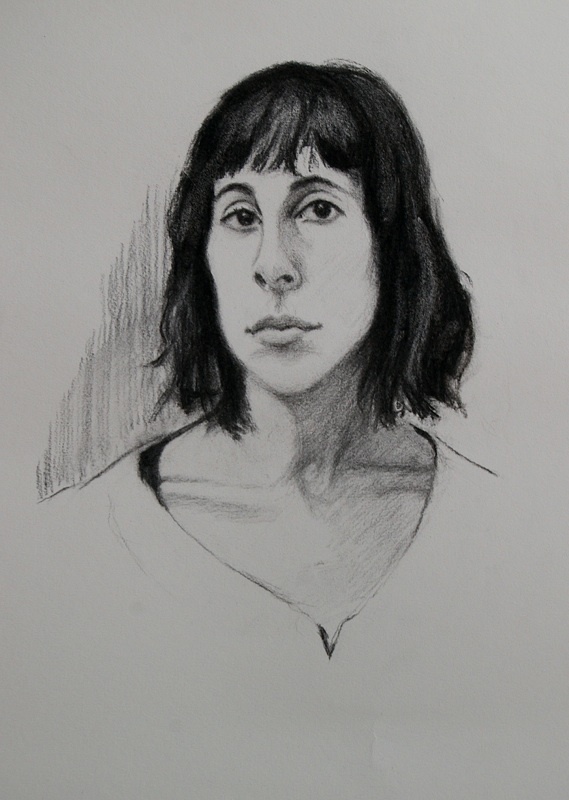 To test things out, I hired a model and did a quick charcoal sketch. This was done in a single shot one morning. The results were only acceptable. This confirmed my suspicions that I was not going to be able to get the kinds of light that I wanted from this particular studio. One alternative I explored was constructing a light box. 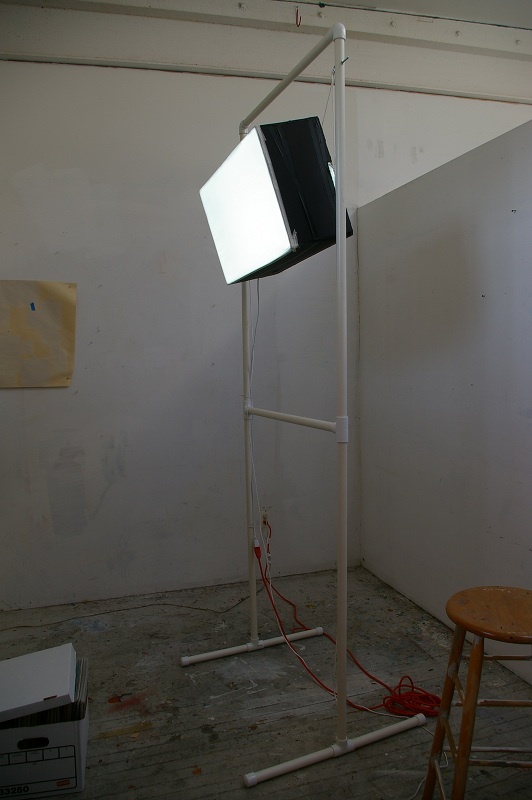 The concept of the light box was to artificially mimic the good attributes of natural light. 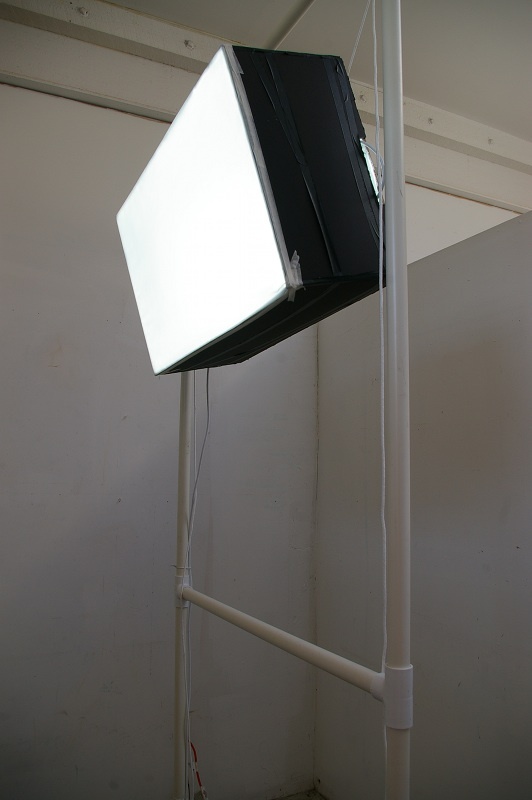 The light source would be multiple daylight temperature fluorescent lights. A simple box would house and support the lights, and a frame would elevate the box up in the air. I threw together a quick prototype, which was a challenge without easy access to power tools. Here is a shot of the light box fully ablaze. This box uses a pair of cool daylight temp grow lights. These are compact, bright for their size, and are designed to be easy to hook up together. The mouth of the box is covered with vellum to help disperse the light. The frame is constructed from PVC tubing and is about 8 feet tall. DIY grow light stands are built a similar way, that was my inspiration. The light produced by the box was decent but nothing to write home about. It did share some positive attributes of natural light, and had some unnatural qualities I did not like. Perhaps with some tinkering and a real box I could improve the concept further. Over the past month I have been spending time in New York. One of my objectives upon my arrival was to locate a proper painting studio, hopefully equivalent to the one I had back home. Before my departure, I mixed and tubed as much paint as possible. I wanted to have lots of paint at my disposal. I brought along the majority of my studio supplies and equipment. This picture was taken before I had put things together. I built the box to support what I hoped to be future portrait subjects. 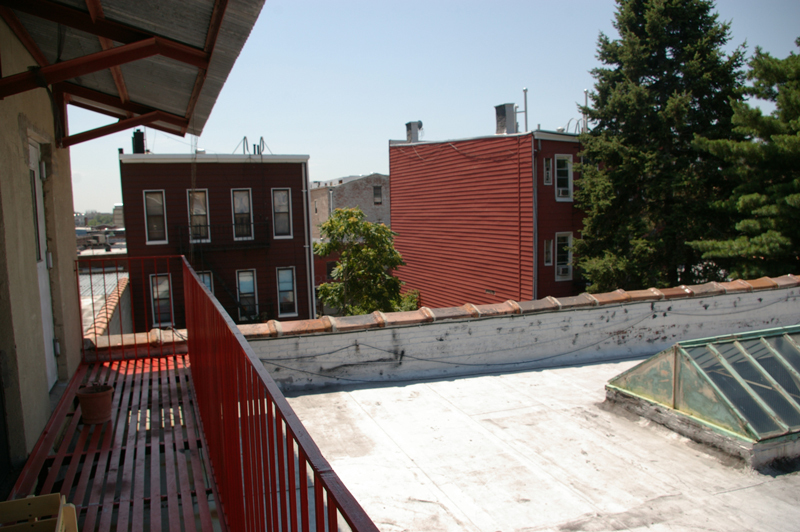 The studio includes rooftop access. 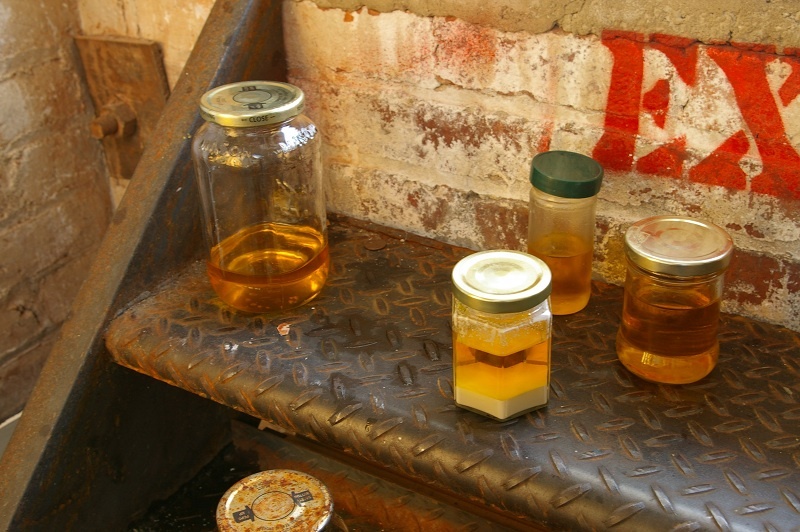 During the summer months I usually make my own linseed oil from scratch. 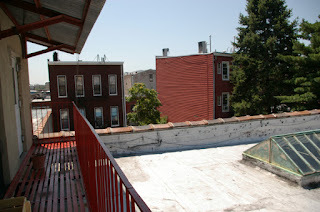 This requires ample sunlight, and the rooftop is perfect for this task. My approach to my craft is very hands on, as this blog will attest. I had concerns going in that I would not be able to maintain these practices in a much smaller, urban environment. So far the techniques have proven to be very adaptable. 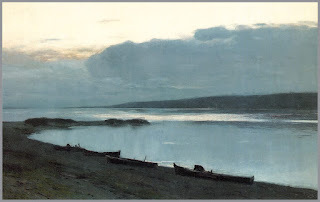 Isaac Levitan (1860-1900) was a Russian landscape painter, considered one of the best of the 19th Century. His family was of Jewish origin, during a period of organized political animosity under Alexander II. 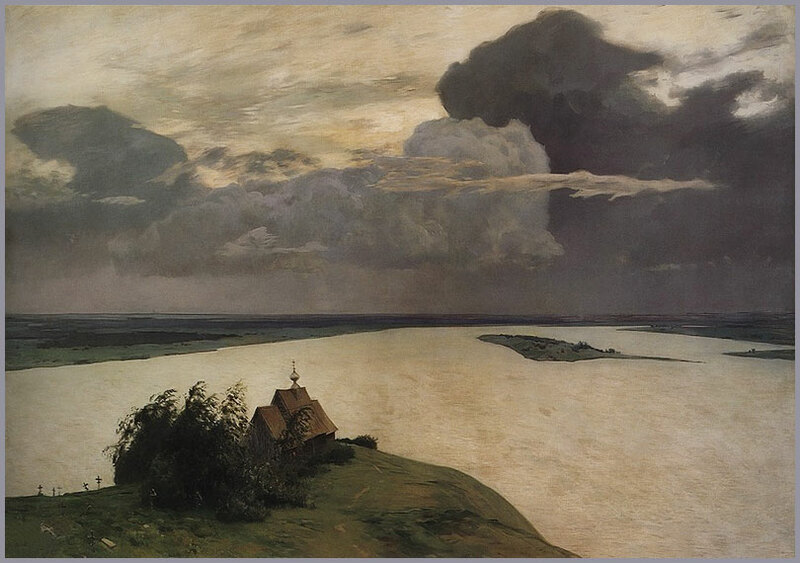 Levitan was able to overcome this based on the strength of his art, achieving support and patronage. 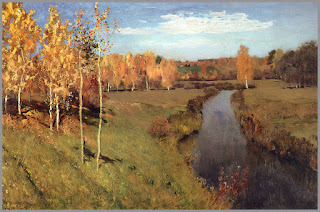 Levitan is recognized for his ability to convey a strong emotional feeling or tone in his works. They are often called "mood" paintings to define this characteristic. This quality of his work is what I connect with most strongly. 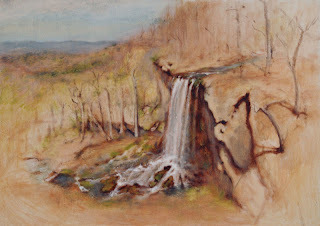 he has over time become one of my favorite landscape painters. His paintings are subtle in their language and message. 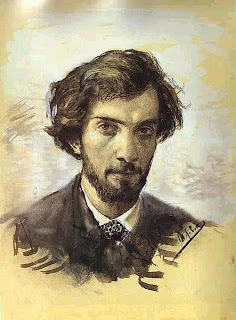 Many works do contain political content, however Levitan never overtly reveals his message, it require knowledge of context. I have never had the opportunity to see Levitan's work in person. The majority of his paintings reside in various museums and private collections inside of Russia. This has also made it quite hard to find good reproductions and western-published books on him. 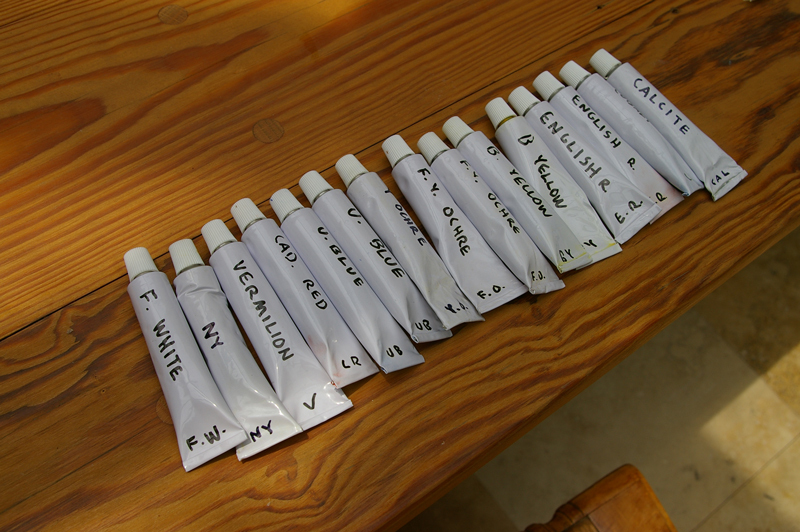 I'm currently trying out a selection of different black pigments, looking for one with just the right properties for my work. Shungite is a unique form of graphite mined in Russia. It shares many qualities with other carbon-blacks and is very intense. 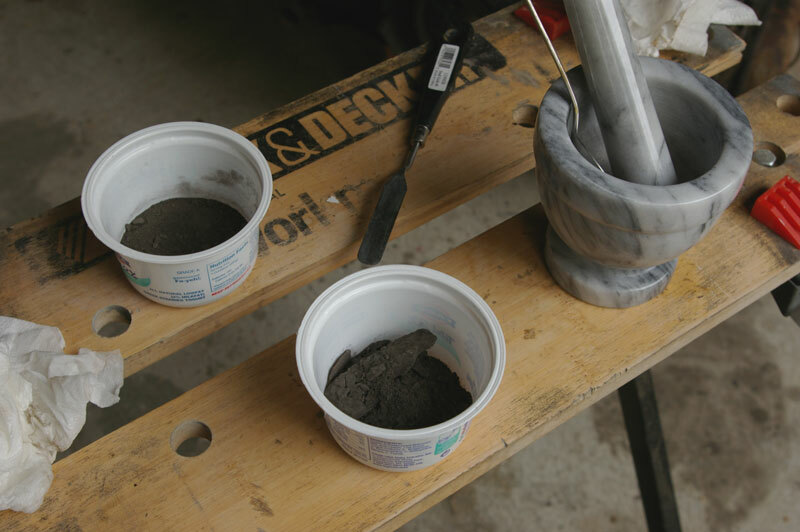 The shungite proved to be surprisingly hard to grind. I suspected that it would not be that difficult, while handling the sample, black easily came off on my fingers. I would recommend purchasing the material in pigment form. 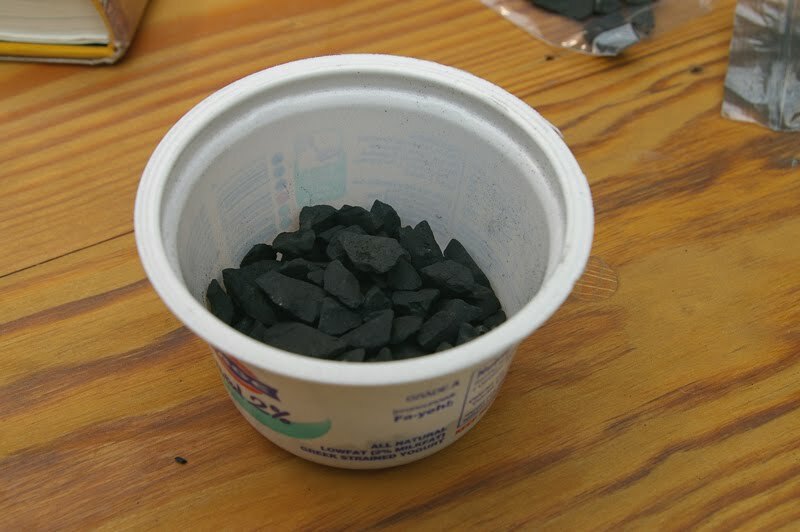 Natural Pigments is the only western supplier that I know of that carries shungite. The image above consists of shungite on my palette, after having been ground and mixed with linseed oil. I have tinted the black with some lead white, to get an idea of its undertones. Shungite appears to have a sightly cool cast. 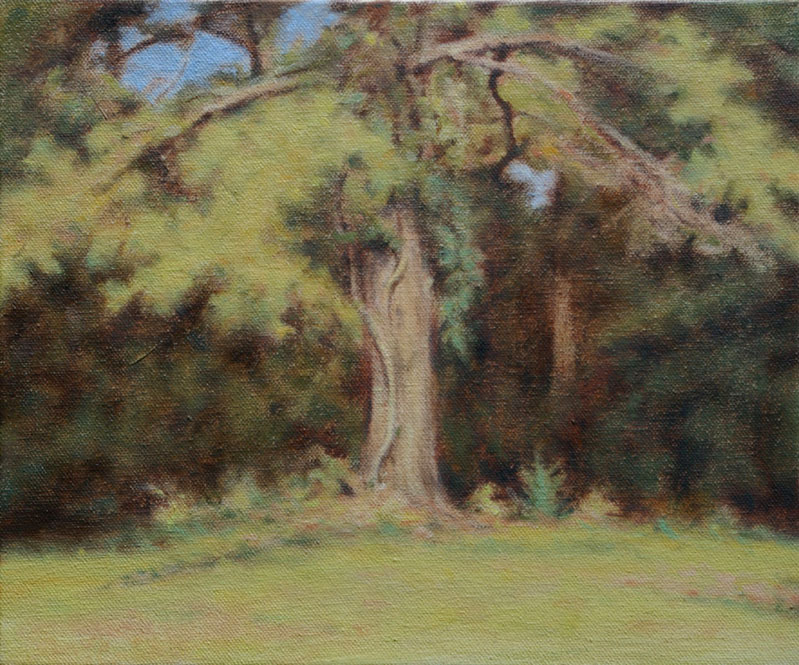 Oil on Canvas 10" x 8.5"
This small and simple picture was inspired by a pine tree situated very close to my studio. I walk past this area all the time, coming and going many hours of the day. At a certain moment in the afternoon, the light falls on this otherwise nondescript tree, and it comes alive. Summer is usually a challenging time to paint outdoors. The light is harsher and more direct, it is usually very hot, and unfriendly insects are abundant. The biggest difficulty is the unmitigated greenness of everything in nature. My aim was to create sufficient variations of color, so that my picture wouldn't bombard the viewer with green. Here is a good example of a "stalled" picture. This kind of picture may start out well, and as it develops, we begin to see things we don't like or didn't envision. In my case, there is something a little too "precious" about this picture in its current state. At the moment, I'm not positive as to the reasons. Maybe it is the time of day, or perhaps the colors are exaggerated in a certain way. Since this is a studio project, I will put it aside until I'm ready to revisit it. This is not a unique situation. I used to try to fight through painting blocks. Sometimes it was successful, but it was a brute force method. These efforts were intense, and could lead to burnout. There are smarter ways to revive a picture that is in a coma. Sometimes we grow so accustomed to looking at a picture from the same vantage point, that we miss obvious flaws. Viewing the picture turned upside down, or backwards using a mirror often helps. It can be comforting to know that other artists have been in the same situation before. Looking at works by other masters will sometimes reveal solutions. In my case, I'm simply going to give it some time. 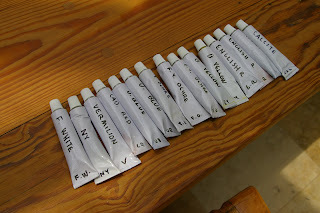 It has been awhile since I have worked on any new pigments. 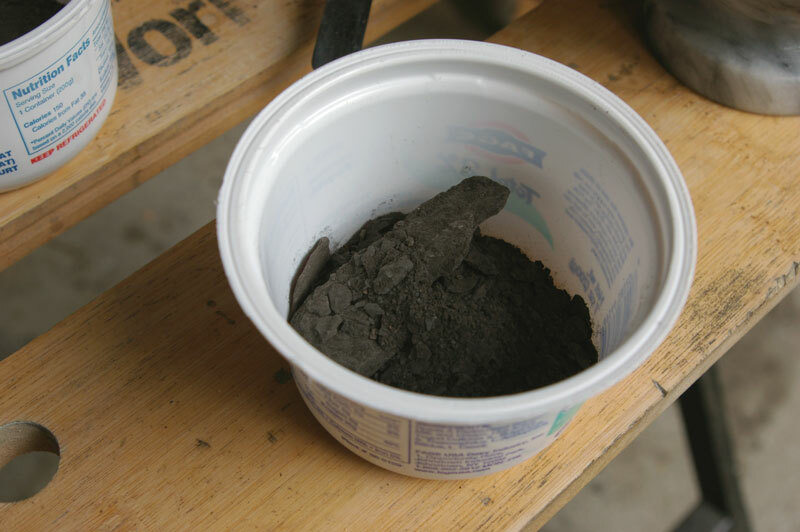 The black shale in the photo is from a mineral sample, that I took last year and had not gotten around to using. A small outcropping had caught my eye while I was in the mountains about four hours to the west. 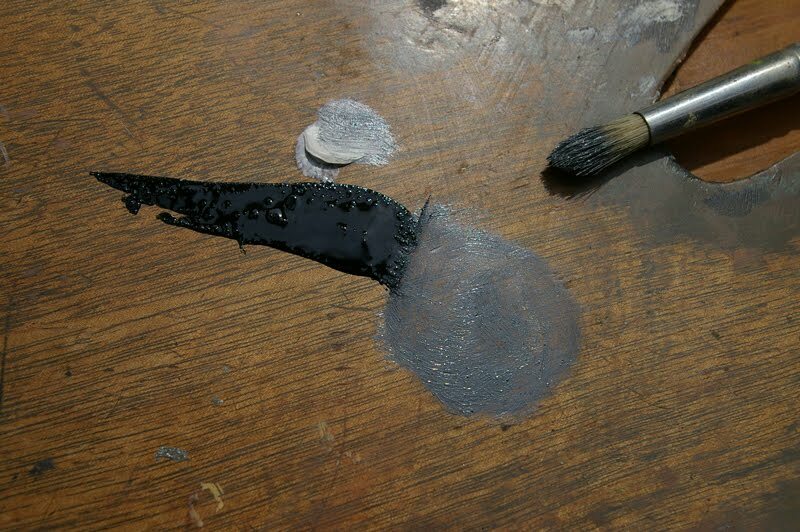 I didn't know very much about my sample, so I wanted to be sure that it would be suitable for use in oil paint. I consulted a local geologist, who suggested that I take a pH test of the sample. After I ground the raw sample, I mixed some with a small amount of water for the pH test. The pH was about 6, slightly acidic. I chose to go ahead to put the sample through my usual process of grinding, washing and levigating. Then I will try mixing it into paint. 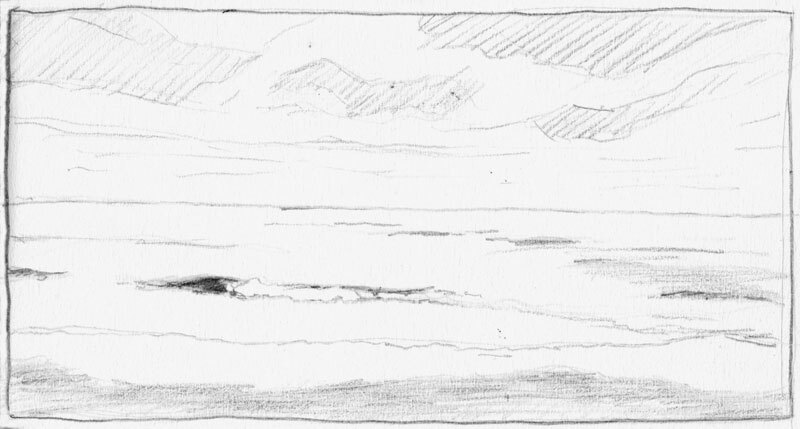 Last week I visited the beach, with the intention of painting my first seascape. While I was planning my trip, I spent a lot of time searching for the right site to visit. I wanted to paint the most unadulterated area possible. Most of the Atlantic seaboard has been overrun by beachfront houses and tourist hotels. 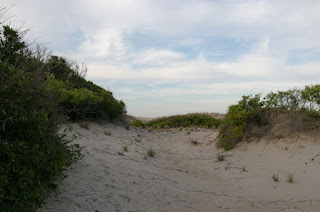 The natural dunes have diminished or ceased to exist. Some beaches have to truck in sand or they would disappear altogether. As a result, its hard to find a beach that feels authentic. My choice was a wildlife refuge not too far from the hotel where I was staying. I visited the site in advance, and enjoyed the scenery. 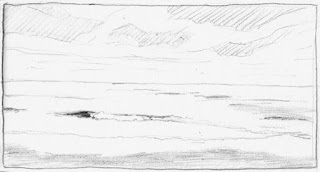 There was lots of interesting things to paint: dunes, beaches, and some wildlife. As the week of my visit approached, the weather predictions indicated a mixed bag: a few nice days punctuated by lots of rain. The forecast also called for strong winds throughout the week. It appeared that there would be only a few days of sunshine. This was discouraging. As I didn't have the option of rearranging my visit, I decided to go anyway and make the best of it. I started working on the painting towards the end of my visit. As it became clear that the weather was not going to cooperate, I made the decision to set the picture aside and complete it in the studio. Oil on Wooden Panel 14" x 8"
Here is another work in progress, nearing completion. 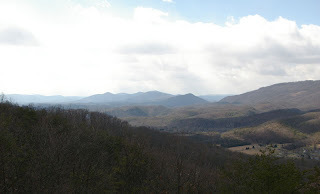 An interesting view from the Blue Ridge mountains, during a passing storm. This is an informal studio project, so that I could experiment with various techniques. I get a little more comfortable and familiar with my historic palette the more I use it. Right now I'm trying to find a good balance between the warmth of the foreground and the drama of the background atmosphere. Cleaning brushes is probably my least favorite part of painting. I'd love to have the means to be able to pay someone to do the job for me. Until that day arrives, it will remain a necessary daily chore. Cleaning a whole set of brushes is easy to put off at the end of a long day. There are other times it is not practical, such as during travel. This is a small tip for those kinds of situations. I heard about the idea from another artist, who uses it all the time. 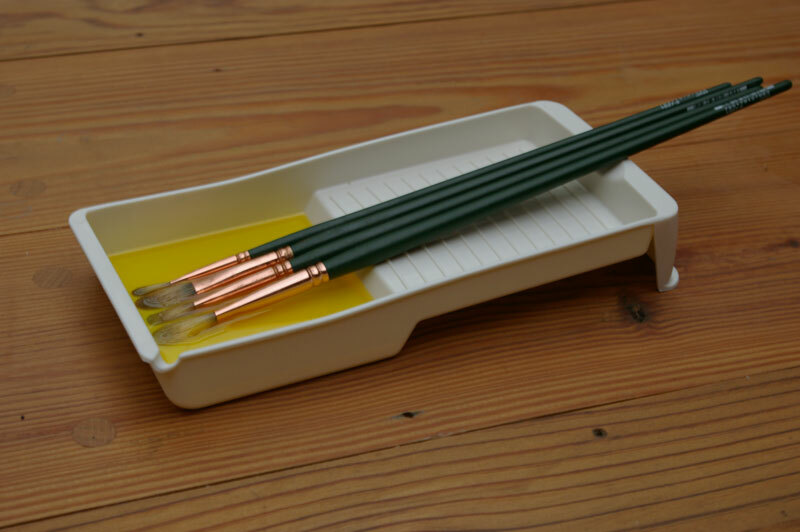 All you need is a small painting tray. I bought this one at a local hardware store. The tray was made for small detail paint rollers, and was inexpensive. 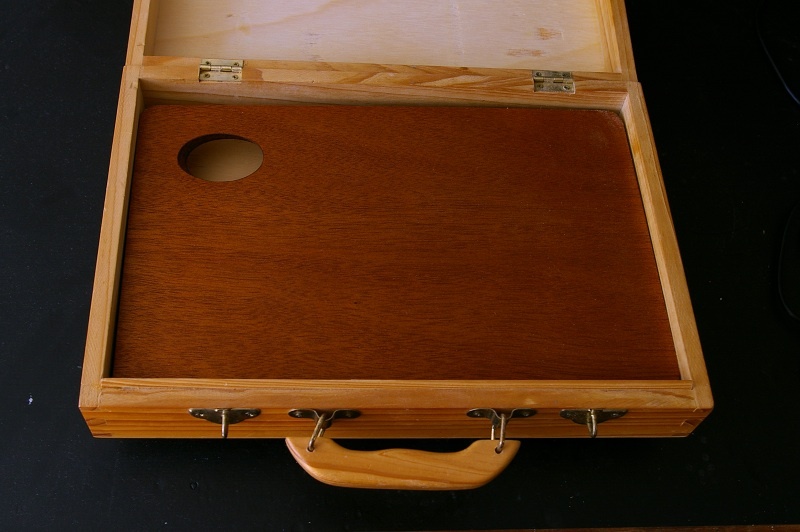 I filled the deep end of the tray with a moderate amount of linseed oil. Brushes are laid on their side so that the bristles rest submerged in the oil. The oil retards the drying time of used brushes, so dirty brushes can be stored for relatively long periods. Later, if I need to use one of the brushes in the tray, I take it out, and wipe it clean on a towel or rag. 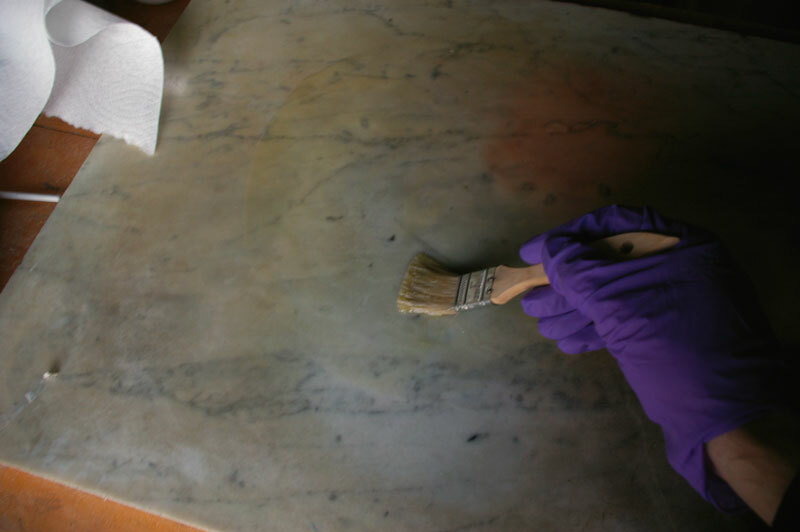 The brush can be put to immediate use, or given a real cleaning. This picture represents my first time painting such a large waterfall. 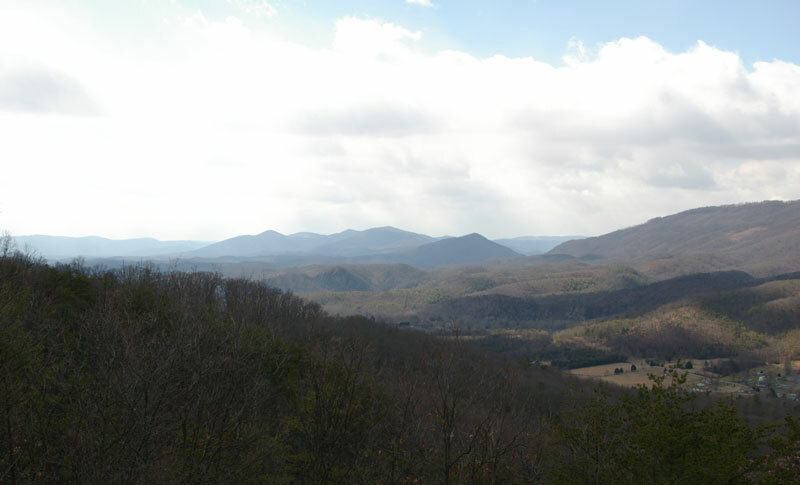 I picked this site as one of my favorites, while looking for new material, outside of Covington, Virginia. The viewing angle was interesting, being off to the side and straight on and square with the falls. I originally visited this site back in winter, with plans to produce a painting later in the spring. The falls is a popular viewing destination, there are already many great photos of it in existence. Comparing pictures from different seasons to my own, I noted that the view would drastically change by the summer. The mass of fully blossomed trees would obscure much of the detail of the rocks and valley below. I made the decision to hurry back before Spring had taken full effect. My main objective for this picture was to capture the power and dynamics of falling water. In order to do so, I felt it necessary to be there in person for the majority of the painting. I'm glad I made that decision, despite all of the extra back and forth driving it entailed. This picture is not yet finished. Now that I have worked out the basic composition, my plan is to complete the picture in my studio. Before I left the falls, I toned the background on the warm side of neutral. The challenge will be to fill in the missing details, while adding some more color. Finding inspiration, and staying inspired, is a process that goes in cycles. With practice, a great deal of inspiration can be found in relatively mundane places or things. Always trying to find inspiration in the same places, can also lead to boredom and frustration. Sometimes, keeping a strong will and fighting through a slump is effective. When fighting doesn't work, it can be even more frustrating. If I sense I'm losing interest in creating art, I try to find ways of becoming involved again. A change of pace or scenery is an effective remedy for boredom. I recently went exploring a new area, several hours west of where I live. I wasn't convinced that there was much for me to see before I went exploring. However once I paid a visit, I found a source for at least several new paintings, and a nice change of scenery. This is another quick figure sketch in the same vein as the previous. Whoever set up this model decided to incorporate props into the pose. I threw some of them in for effect. I am generally pleased with how this one was developing. A light bulb to the right of the girl constantly shone in my face, presenting a challenge. The past week, I had the opportunity to attend a "sketch class" for a bit longer than the usual few hours. I usually don't sketch with anything more ambitious than charcoal, but with extra time at my disposal, I decided to work in oil. Just for fun I also thought I would try using my traditional palette, usually reserved for more "serious" work. Up until that point I had confined the use of my hand-made paints to landscapes, and had never applied them for figurative work. 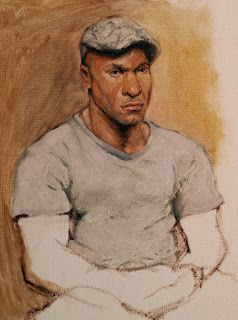 I really like the way I can express the model's fleshtones using these colors. The cinnabar in particular is a deep warm red that stands out in the mixture. I would like to see how I could develop this kind of picture, given more time. Recently, while I was getting prepared to make some new prints, I discovered a new guide to making woodcuts. Written by the printmaker JJ Lankes, it contains a wealth of information I hadn't encountered elsewhere. It is even available to read online, at http://woodblock.com/encyclopedia/entries/011_04/011_04.html. While going through this book trying to digest the new information, I became aware of the contrast between guides to printmaking and painting. Books such as this one on printmaking were written by practicing artists in the twentieth century. They are easy to relate to, being relatively contemporary. In contrast reviving the craft of traditional painting, necessitates perusing sometimes ancient documents. While some things, such as the plight of the artist, never seem to change, we share little else. This leads to a lot of uncertainty. Language, materials and working methods have changed immensely. One often encounters a broken trail of technique, formulas and advice. The need arises to fill in the gaps somehow. Eager to try out some of the tips in the book, I began preparing a new set of poplar boards for carving. 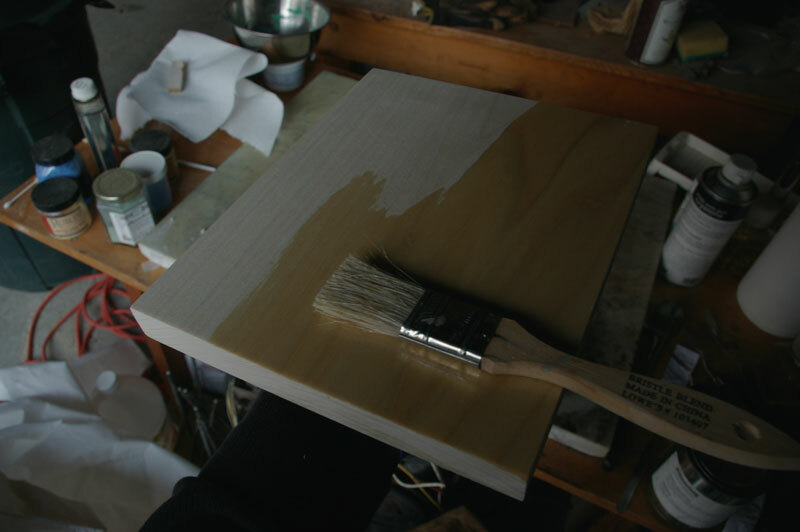 Before carving, Lankes recommends coating each piece with linseed oil. 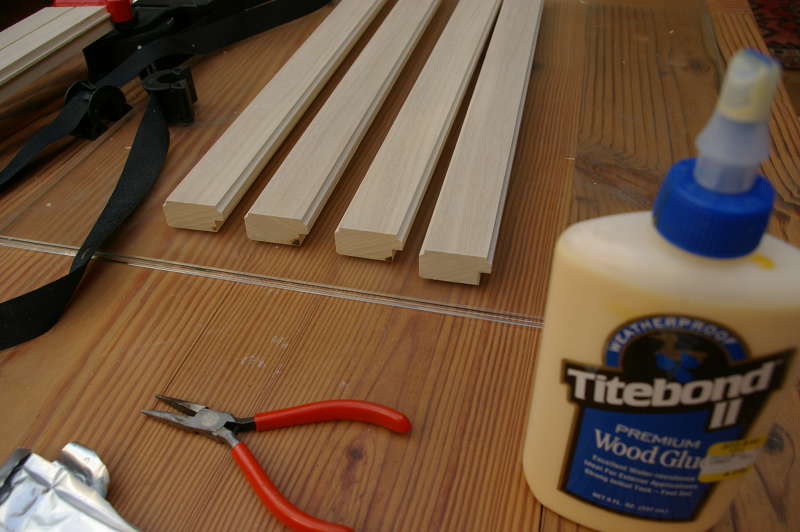 This has the effect of sealing the wood he says, so it is more stable. It is also supposed to tighten the surface grain, reducing its tendency to split under the carving knife. Here I am preparing some linseed oil on my stone block. I mixed the oil with some turpentine to thin it, as instructed in the book. This will accelerate its drying time. Here is a shot of one of the poplar blocks, partly coated with linseed oil. The oil quickly soaked in. I allowed it to cure about a week. The early results are a panel with a nice smooth, tight grain. I will make my final conclusions once I have finished the print.